Ancient history has fascinated many people. Universities offer entire departments of history and classics based on research by historians and archaeologists. However, there are people who have more fanciful beliefs on what happened before recorded history. There are those who believe that life here began out there, that ancient astronauts landed here to become the first humans. Others believe that the ancient astronauts were once worshipped as gods after they provided such cultural leaps as written language and large works of art and engineering*. While evidence is lacking, the concept of ancient astronauts can be jumping off point for a work of fiction. Stargate is one such work of fiction. Released in 1994, the movie established that the Egyptian god Ra was really an alien who needed the body of humans to maintain his immortality. Getting to Earth involved travelling long distances, using a device the ancient Egyptians referred to as a “stargate.” Long since buried, the artifact was recovered in the late 20s and became an object of study, which is where the main characters come in. First, Daniel Jackson, played by James Spader. Doctor Jackson is a proponent of the ancient astronaut hypothesis, and has studied ancient Egyptian history and languages. His research leads to him being recruited by a joint United States Air Force and civilian project to decipher hieroglyphs found on a relic. On the Air Force’s side, Colonel Jonathan “Jack” O’Neil, played by Kurt Russell, has been brought out of his retirement as a failsafe in case the relic is operational. Doctor Jackson figures out the symbols, realizing that they’re not words, but coordinates that inform the Stargate the location of the other end. A team is put together to explore what lies on the other side, including Colonel O’Neil and Doctor Jackson, the latter to work out how to return to Earth, the former with orders to plant a bomb to destroy the gate. On the new world, the team discovers a city of humans, all speaking a variation of ancient Egyptian. During the search for the coordinates to Earth, Ra appears in his pyramidal spaceship to search for a new body. The presence of O’Neil’s team encourages a revolution against Ra by the populace, one that ends when O’Neil’s bomb detonates as Ra tried to escape in his spacecraft. Doctor Jackson remains behind, having married Sha’uri. The movie ends with O’Neil and Jackson saying their farewells and promising to see each other sometime in the future. Stargate could have ended there, its main plot wrapped up. There was room for further movies; the idea of turning a popular movie into a TV series wasn’t known at the time. Other than M*A*S*H, the only other recent example was Buffy the Vampire Slayer, which had started airing in March of 1997, with Mortal Kombat coming in 1998. June of 1997 saw the pilot of Stargate: SG-1 debut. “Children of the Gods” aired on Showtime, as would the first half of the series’ run. The bulk of the cast of the movie was replaced, with Richard Dean Anderson playing Colonel Jack O’Neill, “with two l’s” and Michael Shanks playing Daniel Jackson. 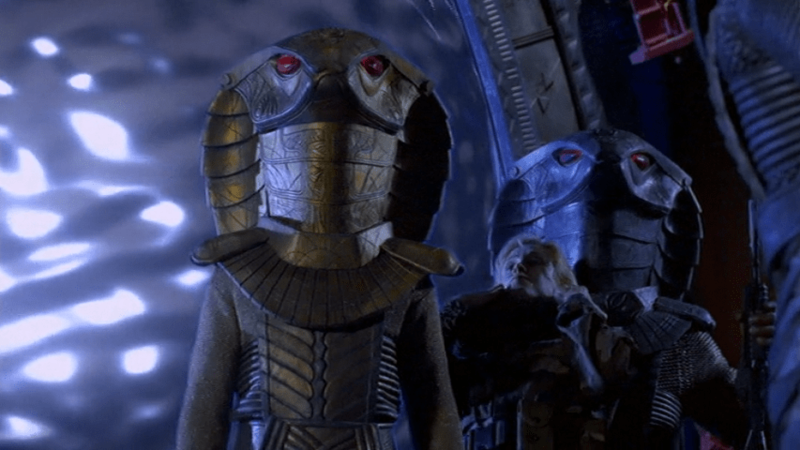 “Children of the Gods” starts with the Stargate, inactive but guarded over the three year difference between the movie’s release and the airing of the pilot, coming to life. Beings similar to Ra and his soldiers march through, killing three of the guards and kidnapping the one woman on the squad. As a result, Colonel O’Neill is brought back from retirement again, this time by General Hammond instead of General West. Hammond gets the truth from O’Neill in a quick recap of the movie, including the part where the Colonel sent the bomb to Ra’s spaceship instead of destroying the Stargate itself. With that news, a message is sent to Jackson, paving a way for a squad to go through the gate. While Dr. Jackson and Col. O’Neill catch up, the alien who attacked the Air Force team on Earth come through the Stargate on Abydos, the same one the O’Neill’s squad had used. The alien takes away several of the natives with him, including Daniel’s wife and O’Neill’s adopted son, Skarra**. Jackson returns to Earth with O’Neill, determined to find his wife. A briefing by General Hammond introduces the core concept of the TV series, the SG teams. Each team would be sent through the Stargate to the various viable coordinates discovered, coordinates that Dr. Jackson and Captain Samantha Carter, played by Amanda Tapping, have worked out. Jackson and Carter hit it off immediately, as the good doctor’s previous research helps her with her theoretical astrophysics. Together, they work out that many of the coordinates have drifted just from the movement of the galaxy. With the coordinates of the apparent origin of the new alien, Apophis, teams SG-1 and SG-2 move out. The new world is unlike Abydos. Where Abydos was a desert, the new planet is verdant, covered with plants. SG-1, led by Col. O’Neill, is able to find the people taken by Apophis, not just from Abydos but from many worlds with their own cultures. 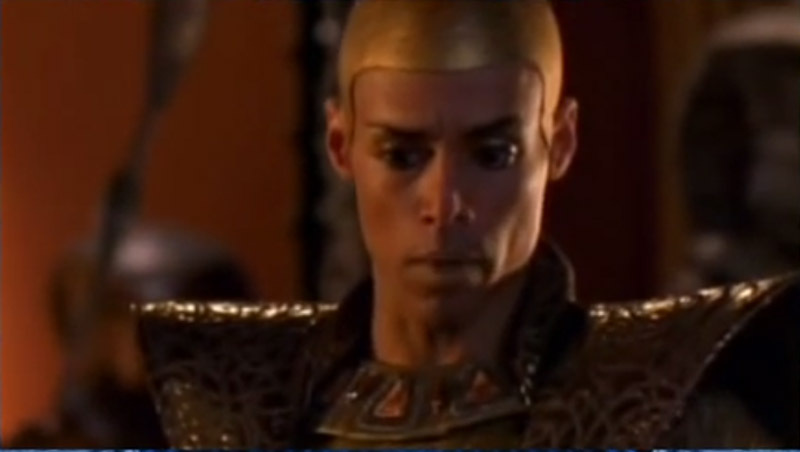 Apophis, ultimately, escapes with Daniel’s wife and Skarra having been transformed. However, Teal’c, played by Christopher Judge and one of Apophis’s guards known as a Jaffa, is impressed by how SG-1 handles itself and believes that they can succeed in defeating the alien and switches sides. With the pilot over, the hard part comes. The cast and crew have to deliver a strong story featuring the characters weekly. Over ten seasons, the longest an American science fiction series has run***, they did just that. The movie took a look at first contact and the difficulty of communicating, even when the two sides can trace back linguistic history. What Stargate SG-1 did was expand the setting, building up Goa’uld and the Jaffa, introducing the Asgard, a species whose appearance was based on the Greys and were responsible for Norse myth, and allowing the technology base on Earth to grow as the series progressed. During this, two spin-off series came about; Stargate: Atlantis, set in a distant galaxy with a team of explorers and specialists who knew that they may never return back home because of the energy required to maintain a wormhole that far, and Stargate: Universe, set on board the Ancient starship Destiny with a crew who are trying to find their way back to Earth. 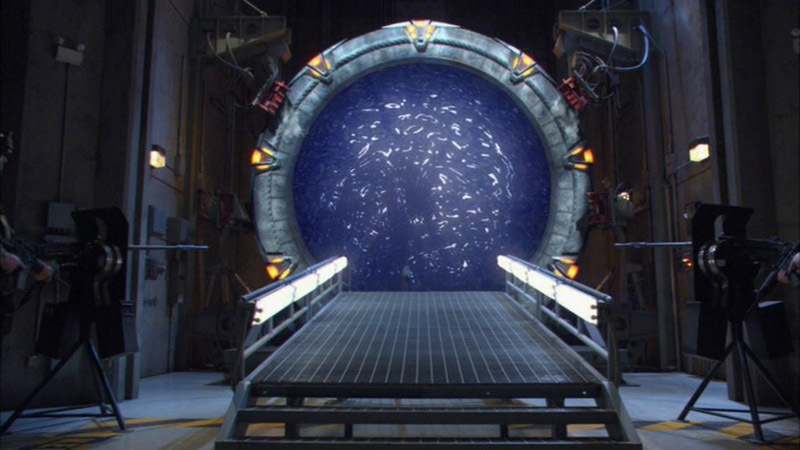 Stargate-SG1 built on top of what was shown in Stargate, taking what was discovered and expanding. The key elements, ancient astronauts and the Stargate’s coordinates, were in the movie and were fully exploited in a way that was consistent with the events in Stargate. The TV series used its format to expand the setting, adding to the movie without ever taking away from it. Next week, the May round up on adaptational news. * For example, the Egyptian pyramids and the Nazca lines in Peru. ** Skaara was played by Alexis Cruz in both the movie and the pilot, making him the only actor who was in both. *** There are terms and conditions here. Star Trek had more seasons but over multiple incarnations. Doctor Who has lasted longer, but is British. General Hospital was a long running soap opera that pre-dated television, but wasn’t science fiction. 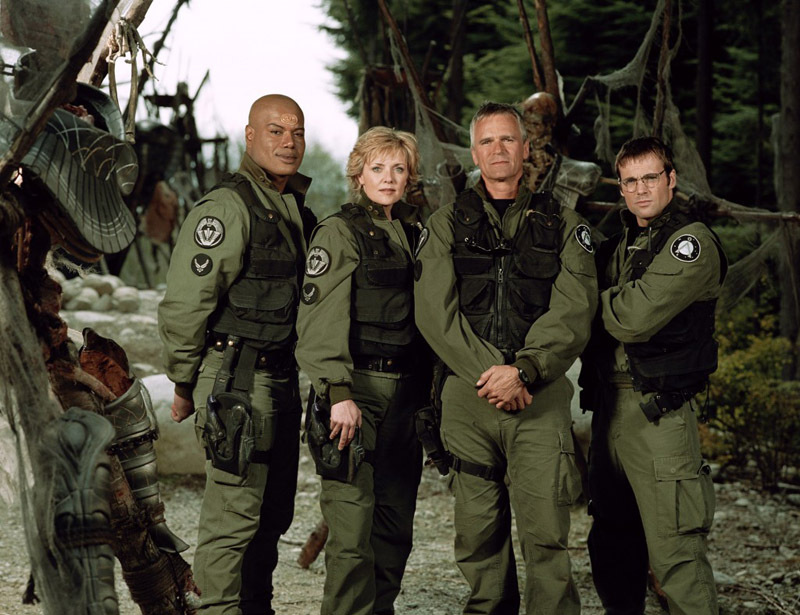 Still, Stargate SG-1 deserves recognition of being able to last as long as it did over two cable stations. By day, Scott Delahunt is an IT analyst, fixing problems and explaining operating systems for end users. By night, he takes his degree in Computer Science, his love of movies, his vast knowledge of tabletop gaming, his curiosity into how things work and becomes a geek! Although he has nothing published professionally, Scott has written fanfiction, scripted an anime music video, play tested role-playing games, and applied his love of bad movies to Lost In Translation. He has also helped put on an anime convention and organize bus trips to Anime North. In his spare time, he raises two cats to become Internet icons and maintains a personal blog, The Chaos Beast.